Using Course Files you may add a batch of files to your Blackboard course at once. 1. From the Control Panel click on Files and then either the right pointing arrow or the course id (shown in screenshot). 2. Hover your mouse pointer over the Upload button and select Upload files. 3. Outside of Blackboard open the directory/folder on your computer that contains the files you wish to upload. 4. This is the box now shown in your Blackboard screen. 5. Drag and drop the files from your computer into the Blackboard screen as shown. 6. You can continue to drop more files from other directories if you wish. 7. As you add files to the box their details are listed. If you wish to change your mind and remove a file click on the corresponding X icon beside it. 8. Click on Submit to upload the files to your course’s Course Files area. 9. The files are now in the Course Files area. 10. The next slides will show you how to add any number of files from the Course Files area into a content area. 11. When you add an item or file you should see two buttons. 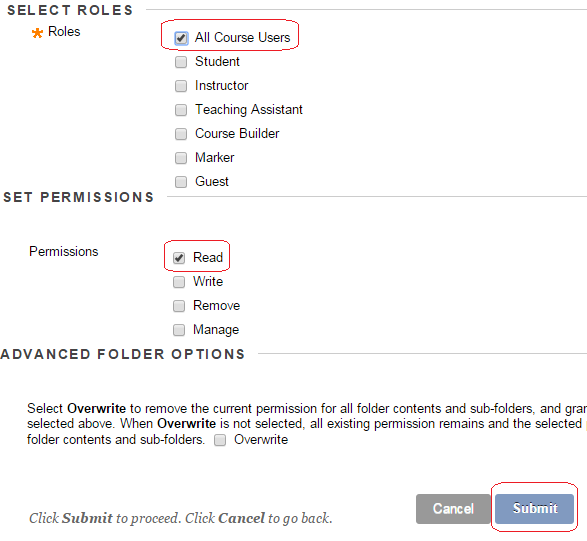 Use Browse Course to attach files that you have uploaded to the Course Files area. 12. When you click on Browse Course a new window appears that shows your Course Files. Use the tick boxes to select the files you wish to attach. Note that there is a “select all” tick box too. 13. DO NOT select a folder. There is a bug in the current version of Blackboard that occurs when a folder is selected which will give students extra access to your course files area and present options that they should not see. They may be able to bypass adaptive release rules or view content not yet made available to them. This bug has been reported to Blackboard and will be fixed in an upcoming service pack. If you wish to add a folder full of files, instead go into the folder and use “select all” on the files within it. 14. Click on Submit to finish. 15. You may be asked to confirm that by adding a link to these files you are allowing members of the course to read them. Click Ok.
16. Back at the add content page you will see the list of files. You can choose to edit the link titles and file actions if you wish. 17. Fill in the other information as usual and click on Submit. 18. The files will be added to your course. The Course Files area holds the files that you add to Blackboard. 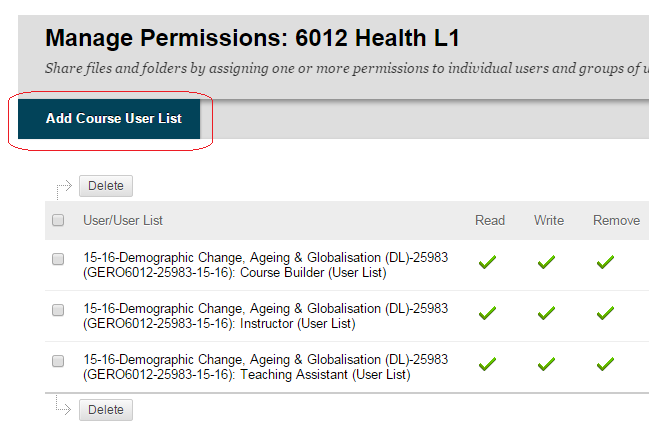 You will only see new files that you add following the upgrade to Blackboard 9 in July 2011. This guide explains the screen layout and what the buttons and menus can do. Course Files is accessed by expanding the Files area of the Control Panel and clicking on the course code of your course. 1. This is the Course Files screen. It you can reach it by clicking on the Files link in the Control Panel. The next slides take you through the different buttons and menus in detail. 2. At the top right you can choose to view the files in a listed format, or view thumbnails. The thumbnail view can be useful for finding images. You may toggle between the views by clicking on these two links. This allows you to upload files, either one at a time or in batch. This allows you to upload a zip file containing multiple files within. Blackboard will then unzip the file contents into the course files area. This allows you to create an HTML object, this feature is not very useful at the moment because such objects can only be used within one course. This allows you to create a folder within the Course Files area. This allows you to create a mapped network drive that goes straight to your course. Once this is set up you may drag and drop files very simply from your computer to your course. Special care should be taken when using this function, especially when deleting files. Web Folders also allow you to edit files directly on Blackboard. Editing files directly via Web Folders should only be done with care and is only recommended for small corrections. 4. The buttons on the next row apply to files you have “ticked”. This button allows you to download files from your course. Tick the files you wish to download and click on the download package button. Blackboard will compress the files into a zip file and ask you where you wish to save the zip file. You may then unpackage the file on your computer. This button will copy any file you have ticked. This button will move any file you have ticked. Existing links should still work. This button will delete any file you have ticked. This will break any links within your course to the file. This action cannot be undone and so should be used with caution. Clicking this button will ensure that you are looking at the most up to date list of files. 5. This is the menu that pops up when you click on the modify button beside a file or folder. Clicking this will open the file. Gives lots of information about the file including file permissions and links. Allows you to change the filename. This allows you to overwrite the file. This is useful if you wish to quickly update the file with a new version. If the file is used in multiple places within the same course then overwriting it here will update each version on your course. Allows you to view and set permissions for the file. Clicking this will allow you to download the file compressed within a zip file. This link will copy the file. This link will move the file elsewhere within the course files area. Existing links should still work. This link will delete the file. This will break any links within your course to the file. This action cannot be undone and so should be used with caution. Blackboard allows you to upload a zip files containing web pages and other file types. This guide explains how to add such zipped content to your course. 2. Create a folder first, into which you will next upload the zip file. 3. Enter a name for your folder and click on Submit. 4. Go inside the folder by clicking on its name. 5. Hover your mouse pointer over Upload and click on Upload Zip Package. 6. Click on Browse and find the zip file you wish to upload. 7. You should not need to tick the box to overwrite existing files – unless you are overwriting an existing package. 8. You should be able to leave the File Name Encoding drop down menu at the default value of UTF-8. 10. Your files will be unpackaged and displayed in the folder you have created in the Course Files area. 11. Click on the “Go up one folder icon” shown above to go up one level. 12. Click on the Permissions icon beside the folder onto which you had uploaded the content. 13. Click on Add Course User List. 14. Tick All Course Users and check that Read is also ticked, and then click on Submit. 15. Now we need to allow students to open the web pages. This is done by adding the index (or alternatively named entry page) as a content item within a course. 16. 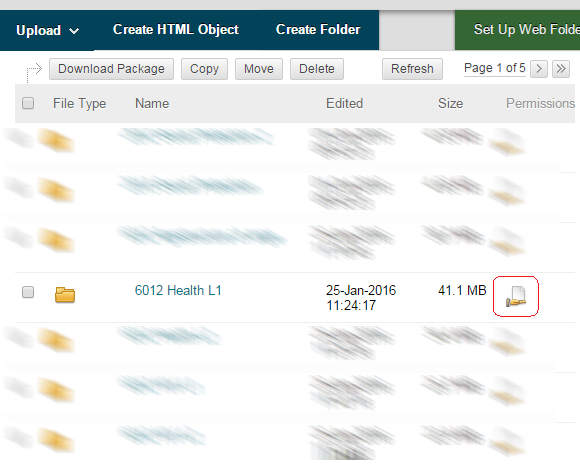 Find the content area in which you wish to add the unpackaged files and choose to either Create Item from the Build Content menu. 17. Whichever method you choose it is necessary to complete the usual details and when adding the attachment choose Browse Course. 18. Choose the entry point – this is whichever is the first page to access the mini site and is sometimes index and click on Submit. In the above example there is only one html file so this is the one we will select. 19. 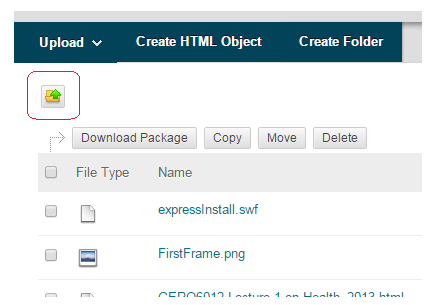 The link title box will show the filename of the html file that you selected in the previous step. Change this to something more understandable, for example “Click Here”. 20. Make sure that Give users access to all files and folders in the folder is selected. 21. Complete the rest of the form in the usual way and click on Submit to finish. 22. Check that your content opens ok by clicking on the link created. “Course Files” is an area of your Blackboard course in which you can see the files that you have uploaded to your course. Course Files can be useful in general for keeping an overview of the files within your Blackboard course and in particular for certain specific tasks. Below is a general overview of the what can be done with Course Files, and two guides on specific use cases. This web page will guide you through the Course Files interface and what the various buttons and boxes mean and what they can do. This guide explains how you can use “Course Files” to upload more than one file at a time to your Blackboard course. Use this guide to find out how to create a Blackboard group into students can enrol themselves.